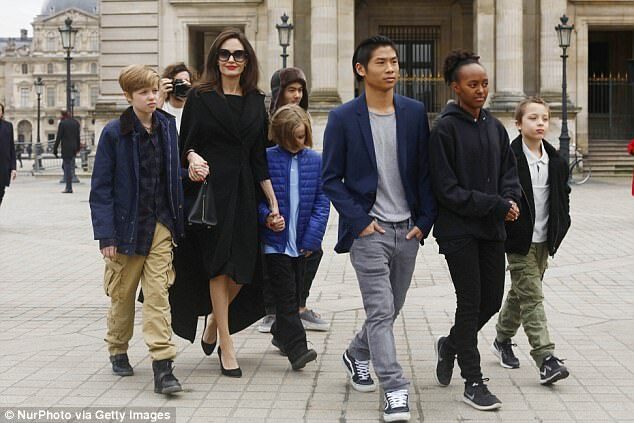 Home Actresses Is Angelina Jolie Dating Anyone, Who Is Her New Boyfriend? In what can be described as the most heartbreaking divorce in 2016, Hollywood power couple and red carpet darlings – Angelina Jolie and Brad Pitt pulled the plug on their relationship which has served as a prodigy to many for so many years, even before they got married. Nicknamed Brangelina, the Mr. and Mrs. Smith costars started dating between 2004 and 2005 and finally tied the knot in 2014. Theirs seemed like a match made in heaven with happily ever after in view but it all turned out to wash down the drains when Jolie and her prince charming announced their split in September 2016, to the dismay of fans. The Brangelina split opened the pandora’s box, revealing lesser-known details about the couple’s not so perfect relationship. They are humans after all and as much as their millions of fans expect them to be perfect, they tend to make mistakes, just like the rest of us. They share six kids together — Maddox, Pax, Zahara, Shiloh, and twins Vivienne and Knox. Some of the kids were adopted from different continents around the world. While they spend more time with their mother, Brad also gets to spend some time with them as well. Currently, Angelina Jolie and Brad Pitt are still sorting out details of their divorce and it doesn’t look like there will be any patching up between the two. Nevertheless, they appear to be in a good place, following their split and there is no serious beef between them, at least none that we know of. They have been successfully working around their busy schedules to make out time for the kids. Is Angelina Jolie Dating Anyone? Both Brad Pitt and Angelina Jolie have reportedly moved on from their breakup with the latter supposedly in a relationship with someone else. Early in 2018, different online sources reported that Jolie feels better with someone to spend time with. Her alleged beau is said to be a regular bloke who is not in the showbiz circle. The information about him confirms he is handsome, older and sells homes for a living. However, the rumors also have it that the relationship is not a serious one yet. Notably, this would be Jolie’s first try at dating since the Brangelina split in 2016. The question now is, who is the mysterious guy that has warmed his way into the actress’ heart? Amid the speculations going viral about Jolie’s love life, here is what we have been able to confirm so far. Hate to burst the bubble of anticipation for you but Angelina Jolie may not be dating anyone after all. Despite the rumors that have gone viral about the new guy in the humanitarian’s life, who is supposedly helping her deal with the divorce from Pitt, the actress seems to be single at the moment. In fact, she is said to be staying away from dating in the meantime. In other words, her alleged romantic entanglement with a handsome real estate agent was all a hoax. In the meantime, the Hollywood heavyweight has a lot on her plate and before you attribute it to her movies and public appearances, don’t forget she has six growing kids who need her attention. She is often seen with them in public places and her world seems to revolve around them. As a result, she may not have the time to start and nurture a relationship just yet. Read Also: Beyonce’s Relationship Through The Years – Who Has Beyonce Dated? On the part of Brad Pitt, the Hollywood hunk and father of six is also keeping a low profile on his dating timeline. Even though there have been speculations about his love life recently, with the rumor mill buzzing with stories about how he is dating women who are not popular, none of the stories has been confirmed. However, one thing is certain, Brad is a changed man since the epic Brangelina split, he quitted drinking, which was one of the issues he had with Jolie, and is now focusing on his career and six kids. For now, he is presumed single which is hard for many to believe.